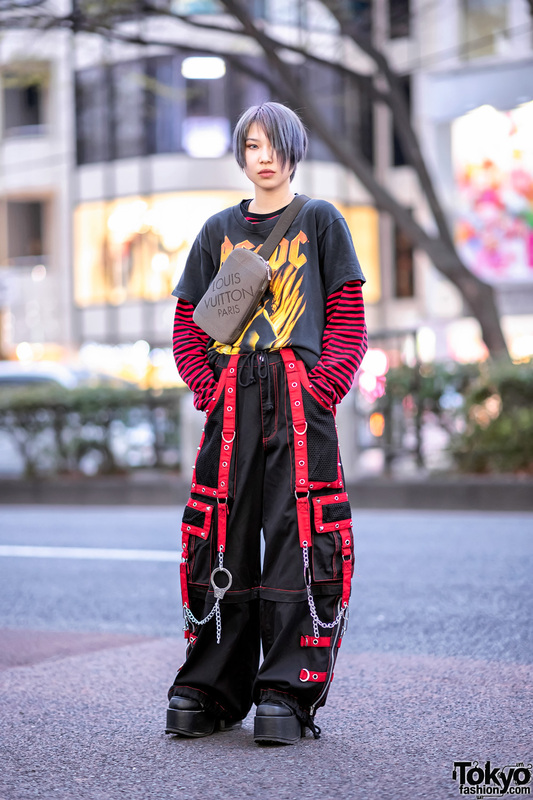 Meet Misuru, an 18-year-old model and part-timer whose eye-catching streetwear ensemble caught our attention on the street in Harajuku. 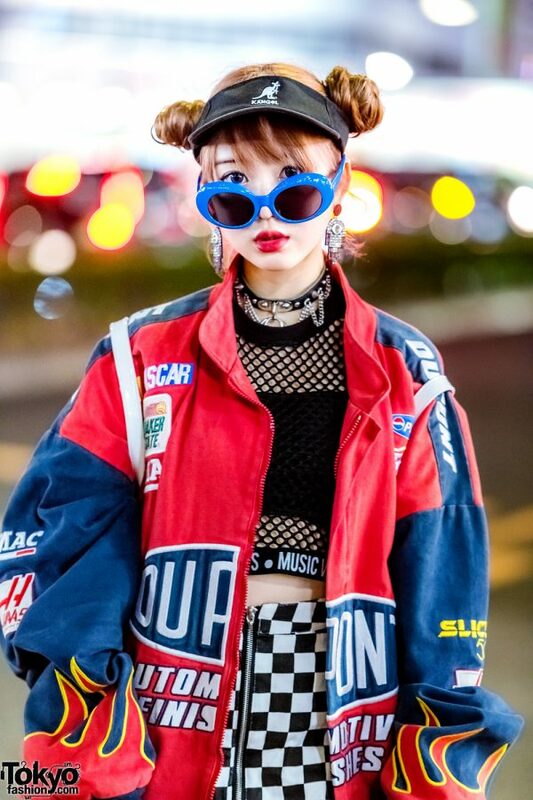 Sporting a twin buns hairstyle framed by a black Kangol visor, Misuru is decked out in a vintage sports jacket with logo prints and flame sleeve hems, which she paired with a black cropped fishnet top from H&M and a checkerboard print zip-up skirt from WC. Misuru finished off her outfit with black knee socks from Nike SB, Yosuke platform baby doll shoes with grommet straps and chain embellisments, and a white patent leather rainbow print backpack from UNIF. Her accessories – from Claire’s and H&M – include blue oversized sunglasses, studded Hamsa earrings, and a black leather o-ring choker. 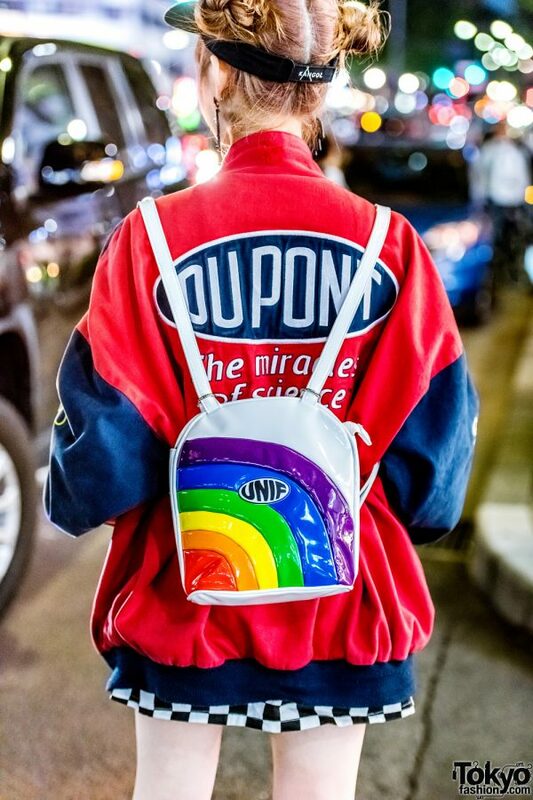 Misuru’s favorite fashion brands are Never Mind the XU, 6%DokiDoki, Galaxxxy, Open The Door & UNIF. She likes listening to music from Blue Hearts and she is active on Instagram.